Offer this Zip Grip power bank at your store to bring in more customers! It's made of ABS and silicone and has a 3500 mAh battery installed. This comes with an attached charging cable with micro-USB and Apple pin connectors. This also features one side with 45 small suction cups for easy attachment to various devices, and a rotating metal finger ring for easy holding. 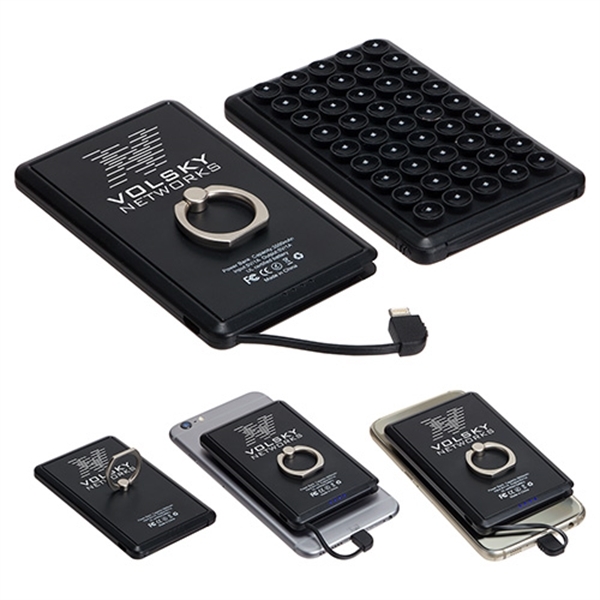 This measures 2.625" x 4.25" x 0.5", comes in dark black, and includes a USB charging cable. Imprint it with your company name or logo and surprise your clients with something special. This would make a great gift at a technology conference! Size: 2.625 " x 4.25 " x 0.5 "
Ship Weight:13 lbs, Domestic Ground:UPS/FedEx only with Lithium labels. Air shipments outside US: FedEx only.